Dave - Just thought you would like to know I sold my 1966 Triumph 2000 to a unique import car collector in Michigan. He and his wife flew out and drove the car home. Designed by Giovanni Michelotti, the Triumph 2000 was built to compete with the Rover P6 in the British "Executive Class" market. Both cars, introduced the same year, looked nothing like any previous British sedan. The 2000 was powered by a 2.0 liter inline 6. With a fully independent suspension, it handled quite well for a large car. Rumor had it that at one point Triumph planned to export these cars to the US. To the best of my knowledge, that never happened. I remember seeing one for sale many years ago (maybe in Hemmings) that was supposed to be one of the few US spec "test mules" that Triumph brought to the States. The Triumph 2000 being offered on eBay is unique because, although privately imported from the UK, it is LHD. The seller has owned it since 1972 and has done some extensive restoration work to it. I'm pretty certain this is the nicest 2000 in the US, but it may also be one of the nicest LHD examples in the world. Triumphs in general are tough, well built cars. Rust can be a problem, but this car, besides being recently restored, spent its life in California, so that shouldn't be a problem. The Lucas electrical components are, well, Lucas electrical components, so expect a few glitches (and smoke) now and then. Parts, except for some mechanical and electrical parts it shares with other Triumphs, are not readily available in the US. However, this car still has a huge following in the UK and you should be able to find most parts there. Many of the older, "unique" cars I feature on Just A Car Geek are hampered by their age and uniqueness. They are cars that are cool to own, but not ones that could be used on a regular basis. 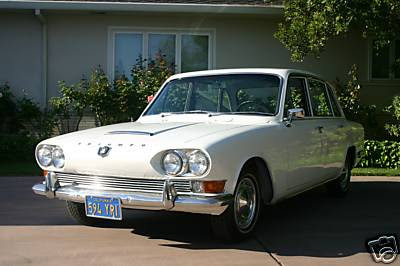 The Triumph 2000 is a car that, if you choose, could be driven regularly. I don't think I'd want to commute to work in it or leave parked in front of the local supermarket, but this is a car you could drive more than just to and from the occasional car show. Click here to see the eBay listing for this 1966 Triumph 2000. Click here to find the Triumph 2000 / 2500 / 2.5 Register website. Just thought you might like to know.. the Triumph 2000 was genuinely sold in the US in 1966/67. I have a 1966 2000 that was bought from BMC Seattle that year.. it's currently a "restoration project", but it'll be on the road at some point! My next door neighbour has an unrestored Triumph 2000 - he was going to restore it, but a mid 1970's Rover P6 3500S got in the way!